As the announcement of the programme for the 2010 BBC Proms season approaches so the spin begins. Tom Service, who divides his time between working at the BBC and puffing the BBC at the Guardian, starts his own rotations on his Guardian blog with a fantasy Proms competition. Now, as in previous years, I will be leaving the promotion of the BBC Proms to those who are paid handsomely to do so. But I can't resist joining in the fun of a fantasy Proms competition. My fantasy Prom is quite simple. Tom Crowe or Cormac Rigby as presenter, not a single plug for the BBC New Generation Artists Scheme, and no applause between the movements. The choice of music simply does not matter to me, that is how bad things are today on BBC Radio 3. Cormac Rigby is on the extreme right of the back row in the photo above, Tom Crowe is almost cropped out on the left of the front row. 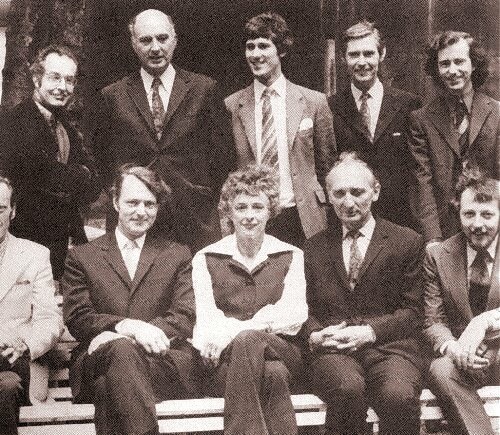 For readers old enough to remember them all the Radio 3 announcers in the 1972 photo are identified below. And before anyone posts a comment about grumpy old men here is a reminder of the first UK performances those presenters introduced so unobtrusively at the 1972 Proms, the conductors are in brackets. - Gordon Crosse Celebration - world premiere (Colin Davis). Tom Crowe makes his mistakes with style here, Cormac Rigby - in every sense a good man - is here, and the art of the animateur is here. * 1972 BBC Radio 3 announcers are back row left to right, Jon Curle, Victor Hallam, Tony Scotland, Donald Price, Cormac Rigby, front row left to right, Tom Crowe, Peter Barker, Patricia Hughes, Robin Holmes and Norman McLeod. Talking of mutual admiration societies - the shortlist for the 2010 Royal Philharmonic Socirty's Awards have just been announced. This year the mutual admiration reaches new heights. Among the nominations are two for the BBC Symphony Orchestra and one for the BBC Proms, which Roger Wright is director of. I received the press release giving details of the 2010 nominations, which was embargoed until 7.00pm on April 8. What is the significance of 7.00pm on April 8? It is the time BBC Radio 3's In Tune came off-air, and that programme had an exclusive run at announcing the RPS award nominees. Shame on the venerable Royal Philharmonic Society for selling out its independence and credibility to the BBC. I had a rare outing to the Barbican a couple of weeks ago to see the BBCSO in some Brahms and Martinu. I was taken aback when Petroc Trelawny walked on stage at the start, microphone in hand. He then began to patronise us and it dawned on me that he was actually the presenter on BBCR3 and it was going out live. I shuddered and remembered Patricia Hughes. Webrarian, Aldeburgh Music brochures indicate if a performance uses amplification. Did the Barbican brochure/website warn that Petroc Trelawny was part of the performance? Any concerts featuring Petroc Trelawny should carry a clear health warning in my view.